CONPLAN 8888, the United States Strategic Command's "Counter-Zombie Dominance" plan for dealing with the rise of the undead, is not a joke. In case there's any doubt that the Pentagon's plan to deal with a zombie uprising is a joke, the document's very first full sentence makes it clear: "This plan was not actually designed as a joke." 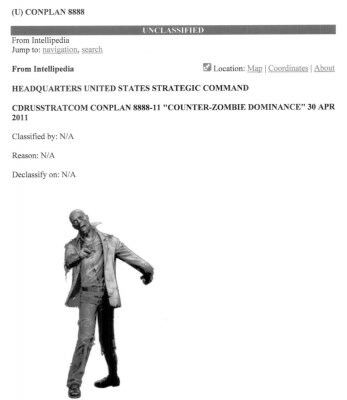 The document states that its purpose is to "fulfill fictional Contingency Planning Guidance (CPG) tasking for USSTRATCOM to develop a comprehensive JOPES Level 3 plan to undertake military operations to preserve all 'non-zombie' human life." The plan has three objectives: To establish a "vigilant defensive condition" to protect non-infected humans, to eradicate zombie threats and to aid civil authorities in maintaining law and order during and after an outbreak. But you may have noticed the "fictional" qualifier in the previous paragraph, and the truth is that while it's not a joke, it's not exactly a serious scenario either. During a training session a few years ago, members of USSTRATCOM realized that "the hyperbole involved in writing a 'zombie survival plan' actually provided a very useful and effective training tool... Because the plan was so ridiculous, our students not only enjoyed the lessons, they actually were able to explore the basic concepts of plan and order development (fact, assumptions, specified and implied tasks, references etc.) very effectively." Zombies also allow the U.S. government to avoid the potential embarrassment and other fallout that could come from using real-world adversaries in its fictional scenarios. But fictional or not, the 31-page document goes into remarkable detail with multi-stage supporting and collateral plans, operational limitations, command relationships and more. It breaks down types of zombies - pathogenic, radiation, evil magic, space, weaponized and many others - as well as their environmental effects and the legal considerations involved in handling them. Even the dreaded chicken zombie (CZ), "the only proven class of zombie that actually exists," is covered. I have no doubt that whoever created this document had a lot of fun doing it, but there's some real-world value to it, too. Fortunately, the Pentagon recognized that fact and kept it unclassified. "Our intent was to place this training tool 'in the wild' so that others who were interested in finding new and innovative ways to train planners could have an alternative and admittedly unconventional tool at their disposal that could be modified and updated over time. We also hoped that this type of non-traditional training approach would provide inspiration for other personnel trying to teach topics that can be very boring," the plan states. "Finally, we figured that an entry like this would not only be instructive, but possibly entertaining for personnel deployed away from their families supporting military ops abroad. If this plan help illustrate how JOPP works and brings a smile or a brief laugh in the process, so much the better." Mission accomplished, I'd say. USSTRATCOM's CONPLAN 8888 can be read or downloaded in full from Scribd.